My Bike, is not the only Bike, that is Running Great Now, with this Exact or very Similar Single Carb Conversion setup. This Single carb. Setup, is a Forumla for success, out of the box success, with the 32DFT 2-barrel Progressive Carb. No Jetting at all, all i did was, remove the Elec. auto choke (It is Not needed) start the engine, and set the Idle to 1000 rpm, Then inspect for leaks, air up the tires and Go for a Ride. I want to provide to everyone, the Best running Carb. 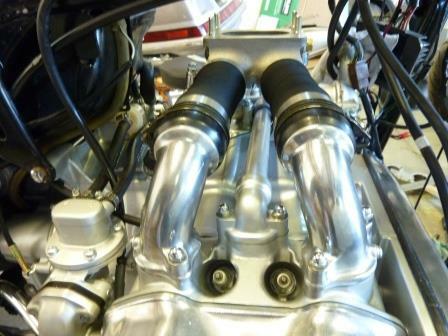 'd Intake system available for the 4cyl. Goldwing. Read through My documentation here of all the efforts Involved, to get to this Point By all that have contributed to achieve this Goal. As well as Others on that site that have contributed. My Bike runs Flawless, no Hesitation or Bogging at all at any time while riding. The others listed above, are having the same great results, that i am having. It is what Honda should have provided. Smooth throttle, No bogging or hesitation at all, anywhere. Engine Revs Extremely Fasst! to Redline. 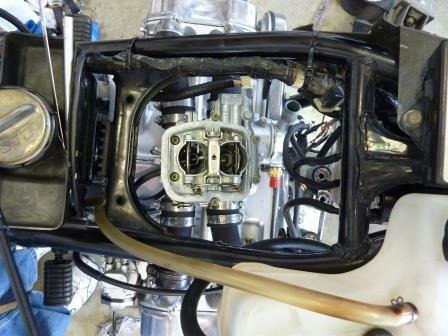 This carb has a Accelerator pump, and is fantastic for throttle response, and start up. This is more like Goldwing 6 Cylinder torque. This more Engine Torque & Power, means more power for pulling away from a stop much quicker than stock, roll on power is much Better, Going through the gears, Is Greatly Improved, More Power for where we Ride our bikes in that 95% of the time, But The TOP end Rush is Also Improved. I will have to get back to you when i find one. 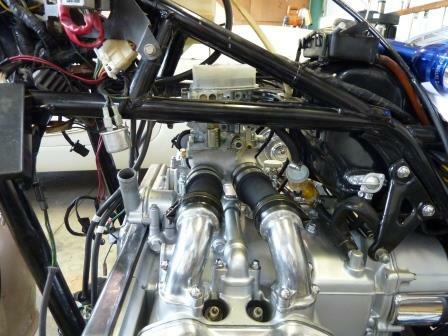 Note: I do not have any MPG figures as it is too early to tell what that might be with this new single carb. conversion. I have a Weber 32DFT 2bbl. 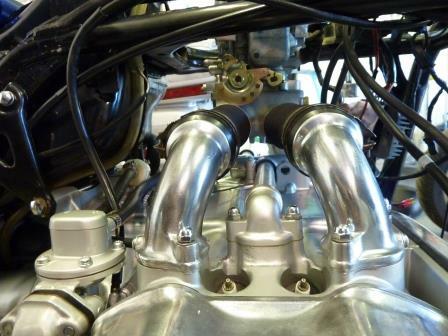 progressive carb on a VW Type IV manifold using silicone rubber hose runners to the Oem GL1100 head stub Manifolds. It Runs Excellent, and the engine revs. to 8K+RPM, Very Fast revving. It runs so well, there is No jetting that needs to be done. It Runs Great Right out of the Box. I have done Absolutely No carb. tuning, other than set the Idle Speed screw to 1000- rpms for a great idle. Thanks to CaptainMidnight85, for the carb. suggestion, and his help. I have gone through 3 revisions so far, this thread will outline those changes, I will be working of revision #4 soon that uses S.S. Brushed and polished Grab bars like the Moen grab bars at Lowes & Home depot, these come out to a very reasonably priced intake tubes that look very professional. Currently I have been riding my Single carb Conversion and trying to get some MPG figures for my 83' GL1100. My fuel economy figures are better than i though they would be if i stay on the primary barrel, but this carb is great cause you have a dual purpose carb all in one good MPG and a Hot Rod side too. 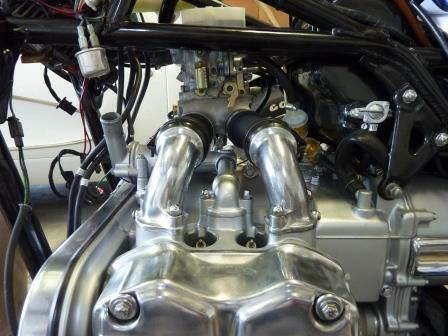 It works very Well in part due to a small Choked Venturi, 32x32mm throttle bores that are choked down to just 22mm each this speeds up the Fuel air charge, that combined with the long intake runners provide Great engine Torque, and More usable power than you ever thought possible. It is our winning combination, that just works very well. We do not try to use a carb. that is Way, Way to big in either Air or Fuel delivery, that plus the rest of this system all provides a winning combination. I removed the auto choke on my 32DFT. as the carb. is too big to fit between the frame for me comfortably with the auto choke on it. There is a vacuum port under the auto choke, that needs to be covered/Plugged. Revised a screw that is taken off the choke can be screwed into the vacuum port, to block it. I made a small block off plate, a manual choke could be made, very easily. I got rid of the oem inlet can fuel filter going into the carb. & put a 1/8" pipe thread 90degree brass fuel inlet fitting. I took off the front solenoid, and put in a plug, and another plug in under the fuel inlet is a smog inlet another plug here. I removed the oem Choke lever arm on throttle shaft. I bought a uni-Link Kit. 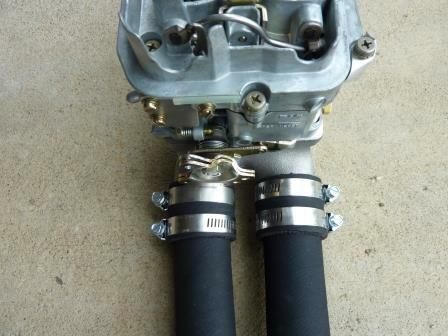 The Uni-Link is what i used to set up my throttle cable, it Holds the stock Pull cable end, and does a pretty good reliable job, I am getting full throttle, at this point and still have more movement at my hand to go than the Carb. needs to go to full throttle at the carb. From what I have read, & when I pulled that vac. unit apart, it looks like there is some adjustment in that advance unit, to advance the timing some. I need to make a bracket for the cable Adjustment Hold. I have a design sketched out, for the stock Cable adjustment Hold. The stock cable may be too long, If that is the case I have another cable that is 4" shorter, it looks just like the 83' GL1100 cable only 4" shorter, i think it was for a CB750 but i will have to verify that I have what bike it was for on the cable. Only problem is finding stuff in my new shop is tuff, a lot of stuff still in boxes after the move, but the new shop is HUGH!!! My bike is a 83' GL1100 and has a Vacuum operated advance. I am Contemplating adding heat to the manifold center section. But i am going to try it without heat first. One thing i did first, on the OEM intake Manifolds, was to liberally coat the the Rubber sections with ATF to clean and soften the rubber, i left it on for about an hour, then wiped off all the ATF, the rubber looked like new, and felt slightly softer, I want a good seal with No Leaks. Here Is a picture, Not done yet but coming along. I have been thinking of doing a single carb conversion since two years ago, But the move to a New House set me back. I currently have 5 carbs. in my shop ready for a single carb conversion. I have enough to play with, to get a single carb working. 1. Weber 32/32, DFT Progressive New carb. $90.00 ea good price point Availability is good. 2. Weber 24/25, 740 Progressive Newly Rebuilt. I paid $125.00+ shipping, availability is OK, but could be better. 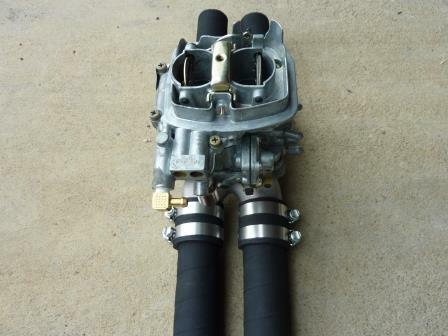 I have seen these listed for $80.00+ shipping that need a rebuild, to over $300. + shipping that have been rebuilt. 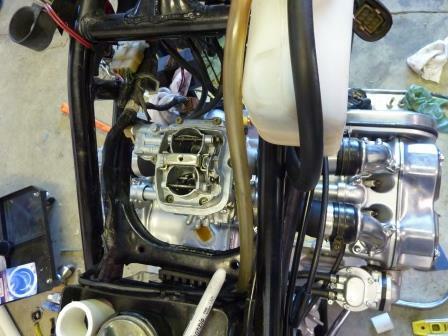 The two carbs above look Identical in every way, except venturi size. 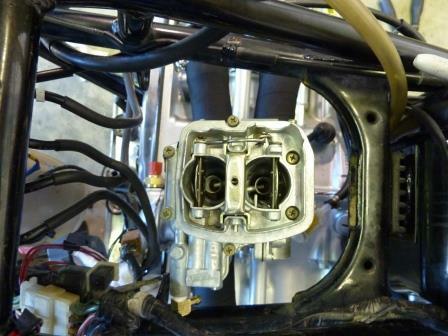 Looking at the carb in your lap, with the three vacuum port tubes facing you the one on the right is for vacuum advance of timing. Putting those hoses on can be a three or four handed deal, especially the last hose. I wish i had the right connection in the shop, I haven't changed them to what I need for my plasma gun and welder, it's a different connector. I could cut out a bracket in no time. I went and got the rest of the clamps i needed today, got the piece of hose for the vacuum advance, so Vacuum advance is hooked up, and fuel line is hooked up. Now i need to put back the cooling system. I need to make the bracket, maybe i can saw and file it, this is tough using manual hand tools, slow to. 7th picture down is my uni kit, for the throttle, it works really well so far and it positively locks the throttle cable end in, so it cannot get loose. Next is to make my cable stop bracket, sure would be nice if my plasma cutter was working, i could make more than 20 of them in the time it takes me to make one by hand. alanc1100 and Jack MacBride like this. 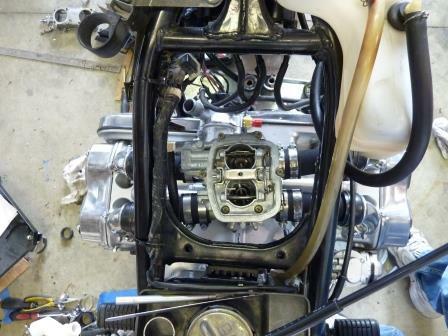 With the VW manifold Installed, I can make an adapter plate, to sit on the manifold and try different carbs. Solex 34pict3 34mm Single bbl. 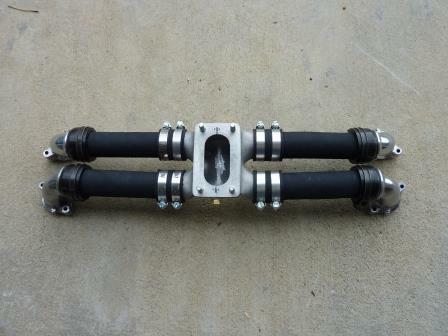 Solex 30pict1 30mm Single bbl. Or my other progressive Two barrel on this. 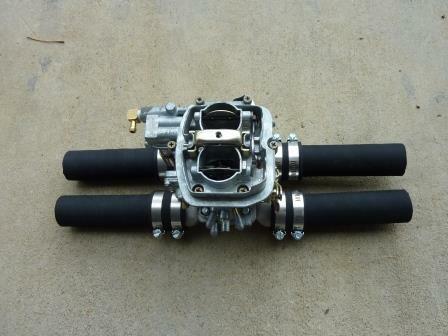 740 carb, It is a 24/25mm two bbl progressive carb. other than the venturi size. From what I can see any way. Good job West! I got mine going today too. Well worth the effort.